finds the maximum flow between source vertex s and target vertex t in a graph g.
finds the maximum flow between vertex indices s and t in a graph with edge capacity matrix m.
finds the maximum flow between multi-sources s1, … and multi-targets t1, …. FindMaximumFlow finds the maximum flow from a source vertex to a target vertex, subject to capacity constraints. By default, the maximum flow is returned. Matrices and SparseArray objects can be used in FindMaximumFlow. Self-loops are ignored, and parallel edges are merged. FindMaximumFlow[data,source,target,"OptimumFlowData"] returns an OptimumFlowData object flowdata that can be used to extract additional properties, using the form flowdata["property"]. FindMaximumFlow[data,source,target,"property"] can be used to directly give the value of "property". With the default setting EdgeCapacity->Automatic, the edge capacity of an edge is taken to be the EdgeCapacity of the graph g if available; otherwise, it is 1. With the default setting VertexCapacity->Automatic, the vertex capacity of a vertex is taken to be the VertexCapacity of the graph g if available; otherwise, it is Infinity. 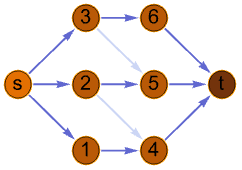 FindMaximumFlow works with undirected graphs, directed graphs, multigraphs, and mixed graphs.